It's been a while since I'm talking on this Blog about AshRa Temple and/or about Manuel Gottsching. And the reason is simple; both names are open doors to the wonderful world of an EM which still had its paths in the Krautrock movement back in the end of the 70's. And I have to start with “New Age of Earth”. This 6th album from AshRa Temple follows a very turbulent era of the Temple where Manuel Gottsching leads the ship by both hands after producing his very first solo album; Inventions for Electric Guitar which has still its imprints on this new album. Being alone on this new phase of AshRa Temple, Manuel Gottsching played all the instruments which were mainly electronic. Making so of “New Age of Earth” the most electronic album from AshRa Temple. Nervous on a rhythm knotted into jerks which roll in loops, "Sunrain" spreads all the magic of the artificial rhythms of “New Age of Earth”. Here, no percussions. Only synth layers finely cut which, stuck together, form a staccato style rhythm of which the very hatched flow is used as rhythmic bed to a soft melody which haunts and haunts and which sings in a drizzle of a celestial fog. The riffs and notes from the Gottsching's Gibson are dripping of intensity on a crystal clear tone and on fine modulations which clean any morphic attempts. We stay wide awake and we catch unmistakably the beat on the strata of synth which transport ethereal melodies and jerky rhythms. At times, a cloud of mist comes to comfort this duel of rhythm and harmony by transposing it towards another level of emotionalism. Without percussions and equipped of an analog synth, Manuel Gottsching maintains a rhythm supported by the genius and his way of modulating an artificial beat shaped by jerked breezes of synth rolling in the air. This is a powerful track of which the skeleton will hold the whole structure of "Deep Distance" which is less heavy but where the loops form a crystalline serpentine of a surrealist transparency. "Ocean of Tenderness" is my Stairway to Heaven of EM. An ode to tenderness with beautiful analog sound effects on a sea of sensibility, of tears, of sorrow. Wonderful, the guitar is crying and makes cry such as a lost soul which suffers from the abandonment, from the bitterness of a past formerly filled with promises. May I say that there were a lot of tears pour and lost in this "Ocean of Tenderness"? An ocean floating on a synth and on its ghostly breezes which espouses the very ambient modulations rocked by a lonely bass line in a sonic sky filled by Manuel Gottsching's guitar laments which is worth any kind of analog synth. This is simply enchanting and magical. An essential track in the EM sphere which is carved on my iPod since years. After "Deep Distance" which is more cosmic than "Sunrain", "Nightdust" drags us into the entrails of an ambient and psychedelic Berlin School very near the roots of Klaus Schulze. Manuel Gottsching multiplies analog modulations and frequencies of a very cosmic and smoothing movement. Whistling, the synth shouts spectral forms of sonic striations which are at the same time scheming and mesmerizing. In this ice-cold blackness, the founder of AshRa mixes some vampiric strata in clothing of drama from an intrusive Mellotron which float and converge towards his finely hatched structures of rhythms build around a fusion of synth / guitar whose soft tears are rolling in the lost loops of a jerky structure. This rhythm pulls the darkness in the half of "Nightdust" and is charmingly wrapped in the floating shadows of an ethereal movement which seems to contain a slightly lower fury at the pace of "Deep Distance". A fury which overflows with a cosmic thick cloud of elements before melting up with the tenderness of a kind of a psychedelic Eden where birds chirp in the singings of a synth and some lines of an organ condemned to celestial harmonies. Like a new age of earth. 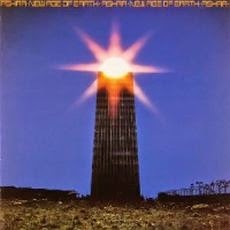 “New Age of Earth” is a classic of the analog EM movement where everything is build from ideas torn away to the unfaithful horizons of hard drugs. Following the rules of hopping rhythms and ambiences with the perfumes of ether that we find on Inventions for Electric Guitar, Manuel Gottsching matures and emerges from his shell by offering us an album which mixes marvellously the chaotic rhythms and ethereal melodies in clearly less mathematical ambiences. He succeeds more than everything in creating a very intimist universe where we feel really alone to listen to his compositions. "Ocean of Tenderness" has to be the most sensitive and emotive track that I heard in my life and was also my open door to all this universe where the music of AshRa and Gottsching was going to become a link between techno and the psychedelic EM. “New Age of Earth” is an inescapable, while that "Ocean of Tenderness" is a necessity to all those who missed it. Hello - Have you any idea which synths were used on this LP? I read on ashra.com that no sequencers were used.